Monica Perry helps her students find within themselves deep relaxation and inspiration through conscious movement, synchronized with focused breathing techniques. Influenced by various yoga styles such as Iyengar and Kundalini, her sequences are based on these philosophies: a focus on breath and body alignment. In postures, she provides variations and gentle adjustments for all body types, encouraging exploration of the mind-body connection through movement, without the fear of pain or overextension. 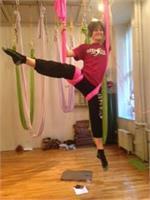 Monica creates a safe, relaxing space that enables her students to find ease in challenging and pushing themselves. The class focuses on remaining in the present, the now, which leaves her students feeling liberated and empowered after a session. Personally, Monica loves music, dance, nature, the arts, laughter of course, and most of all learning as much as teaching. Her insatiable desire to become fluent in the mind-body connection draws her to continuously further her studies at institutions, apprenticing for a wide variety of real-world yogis and teachers. She is Aerial 200 hr Trained and Certified from OM Factory. Follow her on instagram at @monica.yoga and don’t be afraid to say hello!